Happy 2018 GraduationWere so proud of you! Do you remove image backgrounds? How do I know if image I uploaded is good? Will you check the spelling? How do I curve text line as shown in your design sample picture? – 3D crystal laser etching available. 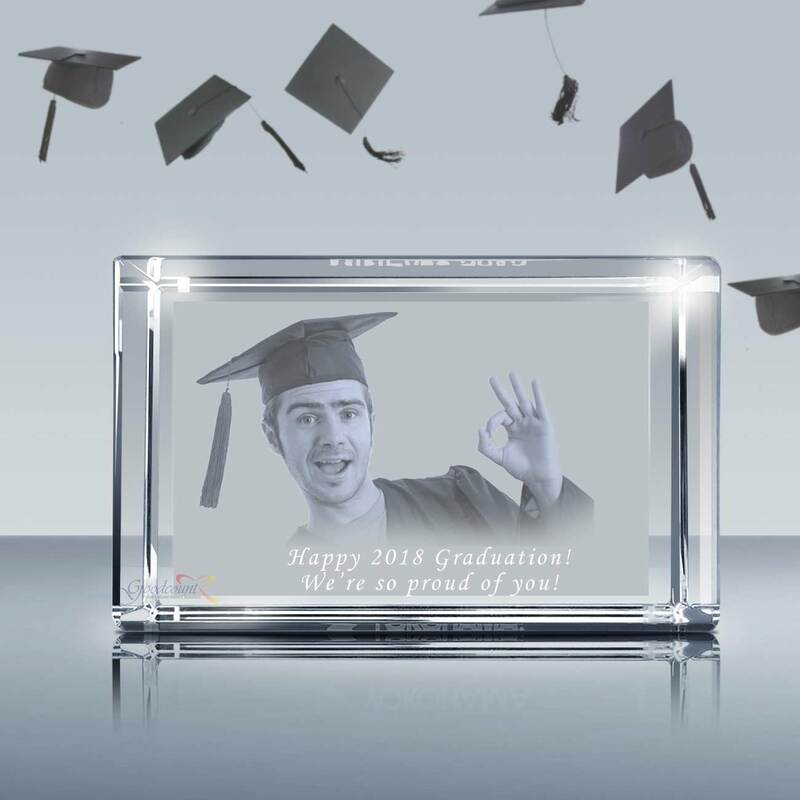 This attractive beveled edged, custom etched 2d or 3d photo crystal makes the perfect gift for graduation, employee recognition, anniversary, or a new baby. 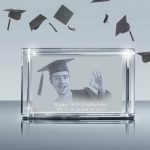 Your photo is professionally engraved inside the exquisite optical crystal. 3d engraved pictures appear to float inside the crystal and can be viewed on all 6 sides. 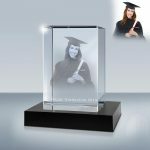 At Goodcount Crystal Gift and Awards, we offer personalized 2D 3D photo engraving crystal gifts, including picture in crystal glass rectangle, photo crystal heart, and laser 2D or 3D crystal iceberg. We also make Crystal Plaques for Corporate Events and Personal Occasion. Whether you need Appreciation Gifts, Christian Gifts, Corporate Awards, Gift for First Responders including police, fire fighter, nurse, Military Gifts, Recognition Awards, Retirement Gifts, gifts for teachers and coaches, wedding and anniversary ceremonies, or more, we are here to provide laser engraved photo etching crystal gift with your custom image and message. Yes, we do. Though in few circumstances, we may decide that it is better NOT to remove. What you see if what you get. The face of person needs to be clear for 3D etching, and file size should no less than 100KB. Sorry, we do not. We will only align the text and image if necessary. Please check spelling yourself before submitting order. No worry, we will curve the text & make it look like the same as in sample design image. You just need personalize the angled text there.